Connector housing, 0.156-inch spacing, IDC type (Insulation Displacement Connector). IDC housings have built-in pins, and wires are pressed or staked into the back of the housing to secure. These connectors accomodate wires in the range of 16-22 AWG (ie: most all common pinball and video game applications). Replaces Bally/Williams # 5792-10818-08 & 5792-10847-08. Locking Ramp: IDC connector housings come with locking ramp tabs molded in, which will lock into place on corresponding pin units that have friction lock backing. Housings with locking ramp can also be used with pin units that have no backing for locking ramps, and vice-versa. 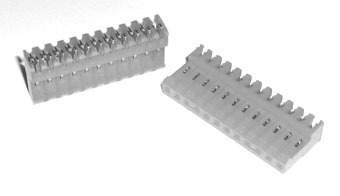 Polarizing Keys (Pins): Most connectors will have one pin that is blank which is the key. This prevents connectors from being installed in the wrong place or direction. New polarizing keys are available separately for some sizes of IDC housings. Image is sample only- actual size/color of item may vary. Sold individually.